If I could give this book six stars, I would give it six stars. 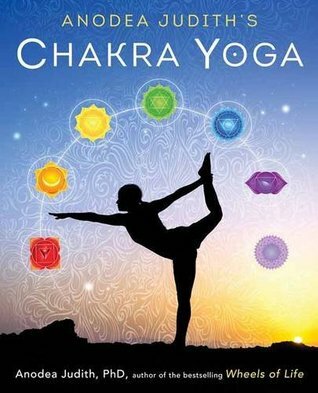 An expert on chakras and a long-time yoga practitioner, Anodea Judith brings her considerable wisdom to this book, offering easy-to-follow instructions for how to use yoga to engage the chakras. Highly recommended. A Really excellent overview of the chakras, what they are, and how to use yoga with them. This book was packed full of information. I loved it. It is a perfect book for the yoga lover. despite the physical weight of this tome (over 2.5 lbs which makes it difficult for me to maintain for any length of time..... this is absolutely the best book of this topic written by the master of the topic. It is a beautifully executed book that I will study for a good long time to come. Great book for a novice instructor like me! It helped to see asanas for each chakra. Great breakdown of the chakras and how to keep them balanced. Helpful photos and descriptions to walk you through each asana. While parts of this book are just a tad too woo woo for me, still really liked it. Especially loved overview before each Chakra section and color coded taps. Good yoga sequences for each area. Super helpful, liked the way she organized poses by chakras, fun to read. Also nice queuing and explanation for each pose. Anodea Judith - Anodea Judith, Ph.D. is the founder and director of Sacred Centers, and a groundbreaking thinker, writer, therapist, and spiritual teacher. Her passion for the realization of human potential matches her concern for humanity’s impending crises — her fervent wish is that we “wake up in time.” She holds Masters and Doctoral degrees in Psychology and Human Health, is a 500 hour registered yoga teacher (E-RYT), with lifelong studies of psychology, mythology, sociology, history, systems theory, and mystic spirituality. She is considered one of the country’s foremost experts on the combination of chakras and therapeutic issues and on the interpretation of the Chakra System for the Western lifestyle. She teaches across the U.S as well as in Canada, Europe, Asia, and South and Central America.